Hundreds of Ethiopian troops in Somalia who have been fighting Al-Shabaab in that country have revolted, with dozens crossing to the Arabian peninsula selling their weapons. 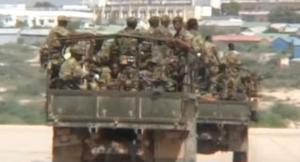 According to ESAT’s military and intelligence sources, the soldiers, who are not with the regular African Mission in Somalia (AMISOM), have not been paid their salaries for three months. About 70 of the troops have sold their weapons and crossed the sea to the Arabian peninsula, while the rest have refused to join the troops returning home. The troops, according to the sources, have revolted due to interruptions in their salaries for three months, ethnic favoritism in the Ethiopian army in which Tigrayans commanders act with impunity.